mmmm… peach cobbler in the summer. Oh, it does not get much better than that! Peaches are slowly coming into season here, what a treat! 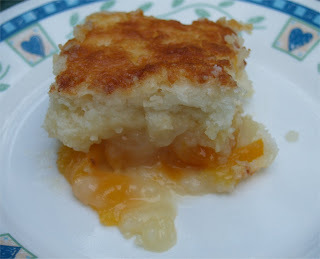 I simply had to make this one killer cobbler this past weekend. Now, dh is a huge cobbler fan and I could never seem to create one that just fit the bill for him. Until I found Paula Dean’s Peach Cobbler recipe last year, now I can make a cobbler. This one is soooo ohmygoshgood; you will not be disappointed one tiny bit. Per Serving (excluding unknown items): 430 Calories; 12g Fat (24.2% calories from fat); 5g Protein; 79g Carbohydrate; 2g Dietary Fiber; 32mg Cholesterol; 439mg Sodium. Exchanges: 1 Grain (Starch); 1/2 Fruit; 0 Non-Fat Milk; 2 1/2 Fat; 3 1/2 Other Carbohydrates. Serving Ideas : Serve with a scoop of vanilla ice cream or whipped cream.